This policy was amended in December 2017, to reflect Lincolnshire's policy and process regarding foster carers who wish to adopt the child they are fostering. A new section, Section 3, The Process has been added and includes a Flow Chart. Note that where foster carers have been caring for a child for a year or more, they can legally apply to adopt that child and the local authority can support them in private proceedings. The same principles apply to foster carers from independent fostering agencies who wish to adopt Lincolnshire children. The plan for every Looked After child must be to achieve permanence. For some children, this can best be realised by the foster carers with whom they live becoming the adoptive parents. However, it is important that any decision about foster carers adopting their foster children is based on sound consideration of the potential of the carers as adoptive parents and that this will be in the best long-term interests of the children. When adoption becomes the plan for a child, foster carers who have formed a close attachment to the fostered child may ask to be considered as adoptive parents; the request should be considered with the child’s timescales in mind. Where a child has been in placement for over one year, the Foster Carers are legally entitled to make an application and the agency may support the adoption of the child by the carers through private law. Ability and willingness to take on Parental Responsibility for the child and a financial and emotional commitment for life. When adoption becomes the plan for a child, foster carers who have formed a close attachment to the fostered child may ask to be considered as adoptive parents. This should always be considered carefully. Research indicates that such placements for permanence can promote the security of a child and encourage the development of a healthy attachment to the foster carers’ family. In such cases, the matter will be referred to the Team Manager who will meet with the appropriate Practice Supervisor and social workers to consider. The proposal will also need to be discussed at the child's Review, to ensure that there is agreement to pursuing this plan. The foster carer’s intentions regarding continuing as short-term carers for other placements and the likely impact of this on the child needing permanence. The child’s social worker has a role in ensuring that the placement will meet the long-term needs of the child. The foster carers’ supervising social worker has a role to ensure the foster carers have considered the impact on themselves and their family of a decision to commit long term to a particular child. 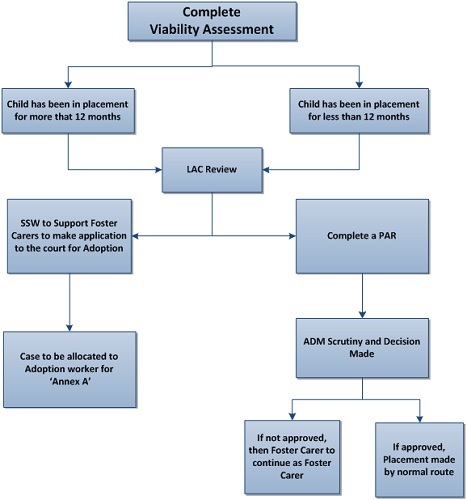 This assessment will be made through the completion of a viability assessment done jointly between the child's social worker and the carers supervising social worker. The positive advantages of maintaining an existing relationship of quality, the perceived durability of this relationship, the benefits of maintaining existing networks of support are all factors that need to be considered and a balance of risks and benefits considered against the uncertainty of seeking to find an elusive "other" placement that may never materialise. It may also be appropriate for the Team Manager to meet the foster carers to discuss their interest in adopting the child. Where the proposed match seems likely to meet the needs of the child, and provided the child has been in placement for more than one year the foster carers will be advised to pursue the adoption through private law and that the costs of this will be underwritten by the agency. Where the match does not appear to be in the child's best interests the foster carers will be advised that any application will have to be pursued through private law but that the agency will not support this or underwrite the costs. In such cases thought must then be given as to whether the current placement remains the appropriate one for the child. If foster carers do adopt under any circumstances this will not necessarily preclude them from continuing to foster either immediately or in the future. This matter should be determined through reference to the Head of Regulated Services for guidance and then an early review. In all case where the foster carer is considering a long-term commitment to the child the potential of this to be secured through the making of a Special Guardianship Order or Child Arrangement Order, as well as an Adoption Order, must be thoroughly explored. Where a foster carer secures either Order, financial support may be paid - see Special Guardianship Orders Procedure. If a Foster Carer wishes to adopt a child they are fostering, they must speak to their Supervising Social Worker (SSW) and/or the child's Social Worker in the first instance. It may be that the prospective adopters have already been identified and approached in which case this may go no further.